For best results, we recommend uploading an image that is 1500x1000 px. The file must be smaller than 5MB and not exceed 5000 px on either height or width. 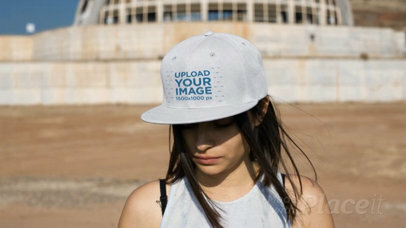 Start promoting your latest snapback designs in the trendiest way, use Placeit! All you need to do is drag-and-drop your design image file on the interface, we will process the jpeg or png file for you in just seconds. Isn't it great? Start using these awesome video mockups and boost your sales! Try another Hat Mockup! 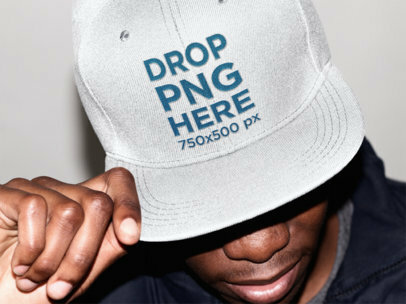 Check out this stylish hat mockup featuring a young black man in a studio. Place your latest artwork over this mockup template and get an instant mockup thanks to this easy to use mockup generator. Use more apparel mockups to create your own advertising campaign in no time. Stop struggling with PSD files and start making your own photorealistic mockups to promote your brand! To see another Hat Mockup click here! Customize your own apparel mockups in no time and start saving money on your budget! Our mockup generator is just the tool you need in all of your marketing campaigns, you just need to drag and drop your image over the placeholder and we'll take care of the rest. 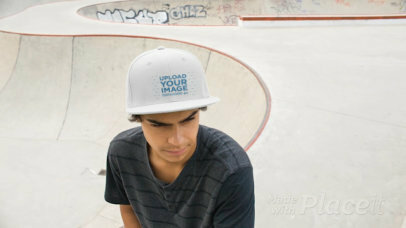 Try your design on this new snapback hat mockup worn backwards by a young man, pretty cool shot right? To see another Hat Mockup click here! For best results, we recommend uploading an image that is 1500x1000 px. The file must be smaller than 5MB and not exceed 5000 px on either height or width. Promote your trendiest designs using this mockup video of a young white man with a mustache wearing a snapback hat, he's adjusting the hat while he's hanging out at the skatepark. 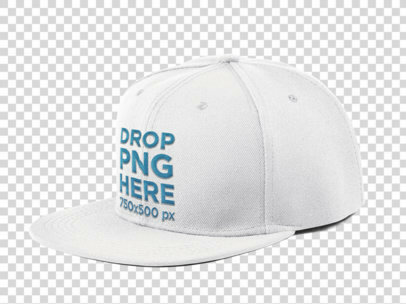 All you need to do is choose a color for the hat and drop your png or jpeg image on the interface. We will merge it for you in just seconds! Isn't it great? Start now and earn more with Placeit! Try another Hat Mockup! 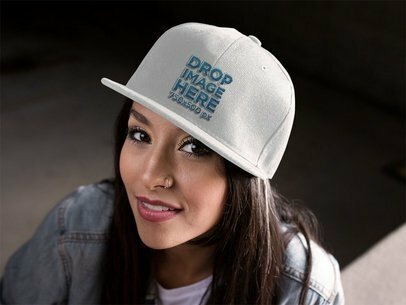 Take a look at this awesome video mockup featuring a hispanic girl wearing a snapback hat while at an abandoned location, it's a great choice if you want to promote your latest design in a more realistic way! Use this awesome video now using the upload button on the left and the HEX tool above it, it'll take just a moment for your video to process. Cool, right? Try another Hat Mockup! 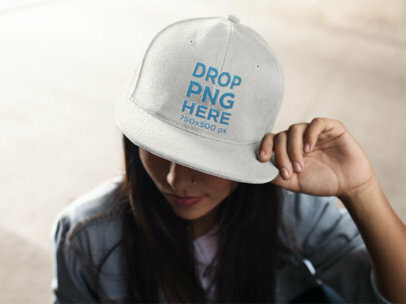 Create your own apparel mockup with this cool hat mockup over a PNG background! It will fit perfectly into your online store and you can use it for different designs, simply place your artwork over the mockup template and you'll have a download in no time, easy right? 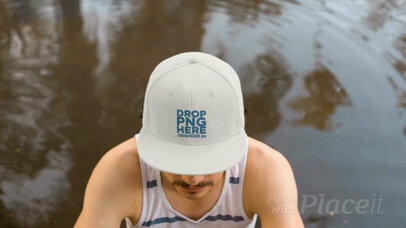 Get more realistic hat mockups from our variety of apparel mockups, all ready to personalize and display your products! To see another Hat Mockup click here! Use this apparel mockup of a hat worn by a young hispanic girl smiling while lying on some stairs. This mockup is perfect for your new apparel designs to stand out in a realistic way! Create more photorealistic mockups with our handy mockup tool that will save you so much money and time from your strategy! See for yourself now why Placeit has all the best mockup templates for your brand! To see another Hat Mockup click here! 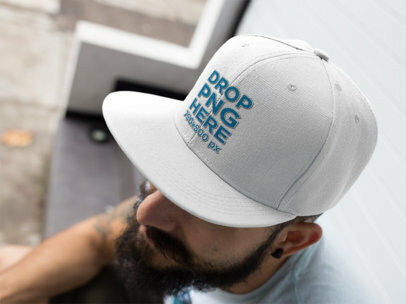 Look at this awesome hat mockup featuring a snapback cap over a transparent background! You're going to love your logo design on this mockup, simply drag and drop the artwork over the mockup template and our mockup generator will create your personalized mockup in seconds. Save time and money when you use apparel mockups to create an impact on your target! To see another Hat Mockup click here! Impress your consumers with new graphics featuring your best designs! 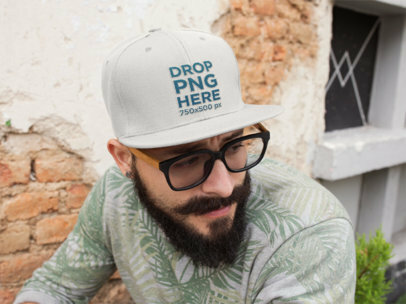 This mockup of a hipster guy with a beard wearing a snapback hat and glasses is just what your brand needs to stand out. Plus it only takes a few seconds to customize, simply drag and drop your image of choice and our generator will have your asset ready in no time! To see another Hat Mockup click here! Start promoting an awesome design using this cool mockup video of a young biker boy in a skatepark leaving his snapback hat on his backpack while he's using the park with his BMX. It's a really cool visual asset that will make your customers love you at first sight! You just need to choose a color for the hat, and drop your image design on the interface. We will process it for you in just seconds! Try another T-Shirt Mockup! 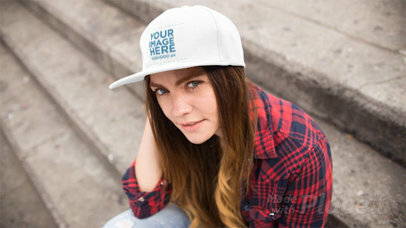 Advertise in style with this awesome hat mockup featuring a trendy girl wearing a snapback hat. Simply place your artwork onto the mockup template and your customized mockup will be ready to download in no time. See how easy it is to create photo mockups that captivate your attention? We have hundreds of mockups to choose from so you can boost your marketing strategy in no time! To see another Hat Mockup click here! Start promoting your awesome snapback hat designs now with Placeit and see how your revenue increases. All you need to do is drag n' drop your image design on the interface, it'll be processed for you in just seconds! High-quality visual assets are a must to sell more. Try another Hat Mockup! 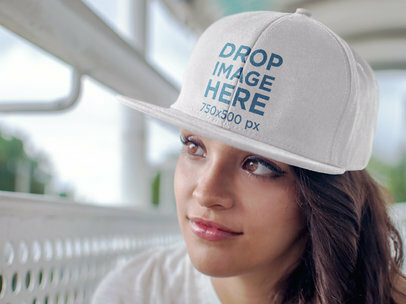 Go ahead and drop in your new artwork on this hat mockup featuring a young hispanic woman wearing a snapback cap at a park. It only takes a few seconds, drag and drop your image over the placeholder and our mockup generator will create your personalized mockup in no time. Try other apparel mockups to build your own advertising campaign and reach the audience you want! To see another Hat Mockup click here! 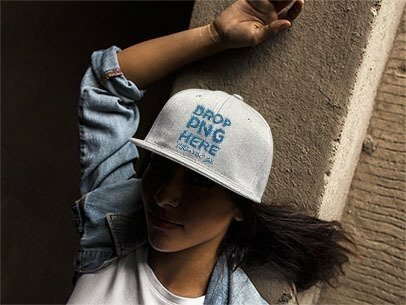 Showcase your next apparel designs on this cool hat mockup featuring a woman lying on casually on a ledge with her arm back, great shot don't you think? You can try it out by dragging and dropping your image over the placeholder, our mockup tool will create your own mockup in no time. Create more apparel mockups for less money and less stress guaranteed, where else can you find mockups as realistic as these? To see another Hat Mockup click here! 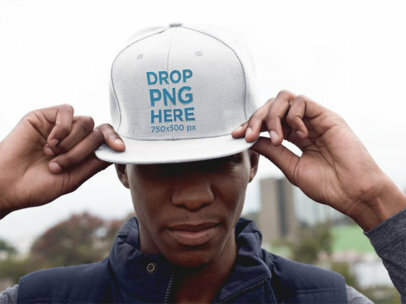 Customize this cool hat mockup featuring a black young man with street style apparel. Just drag and drop your image over the mockup template to see how the final mockup will look like, it only takes seconds! Get more apparel mockups from Placeit's wide variety of mockups, your consumer demographic will relate to your brand instantly and your ads will look better than ever! To see another Hat Mockup click here! 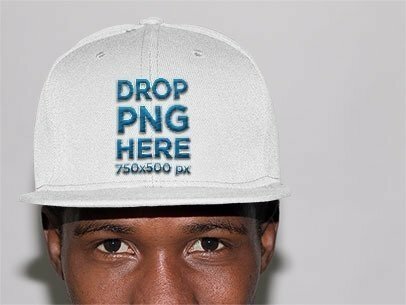 Check out this awesome hat mockup of a young black man in a photo studio wearing a snapback! Place your brand logo or artwork onto this mockup template and let our mockup generator create your customized apparel mockup in just seconds. You'll save hours of design and money from your budget when you use photo mockups curated by Placeit, make compelling visual assets from now on! To see another Hat Mockup click here! Have a look at this gorgeous mockup video of a young girl wearing a snapback hat while making faces and sitting down on some concrete stairways in the city. She could be displaying your own design! All you have to do is drag-and-drop a png or jpeg file on the interface, we will process it for you in only seconds. Great, isn't it? Start increasing your revenue right now, use Placeit! Try another Hat Video Mockup! 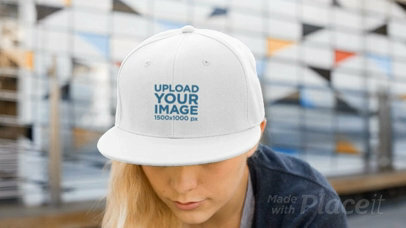 Create your own hat mockup with Placeit's easy to use mockup generator! 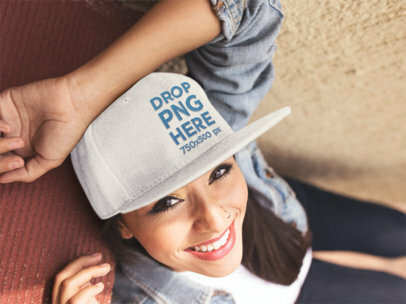 This hat mockup features a young hispanic woman with a nose ring smiling, a cool style to pair with your stylish clothing brand. Just drag and drop your image over the mockup template and you'll have an instant download ready in no time. Save your time and money by using photorealistic mockups to promote your latest products, you'll never regret it! To see another Hat Mockup click here! Make your own clothing mockups with Placeit's mockup generator. 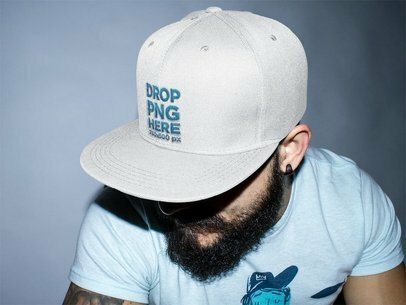 Choose from hundreds of photo mockups to curate your own advertising campaign, this hat mockup featuring a trendy guy sitting casually is a perfect asset to start with, all you need to do is drop your image over this mockup template and we'll take care of the rest for you! It's that easy to create high-quality content that sells! To see another Hat Mockup click here! 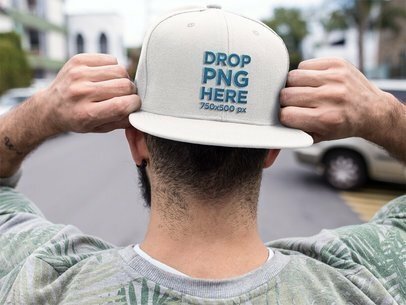 Go ahead and drop in your logo or apparel design onto this amazing mockup template featuring a guy sitting in the street wearing a snapback hat. It only takes a few seconds to customize this great photo mockup and it will save you a lot of money from your marketing budget. Upgrade your branding campaigns with photorealistic mockups made with our easy to use mockup generator! To see another Hat Mockup click here! This cool guy wearing a hat while holding a baseball bat in his hands is a great stop-motion mockup stage for you to showcase your latest hat design in the most trendy manner! Just drag-n-drop your file on the interface, Placeit will merge it for you in only seconds! Try another Hat Mockup! 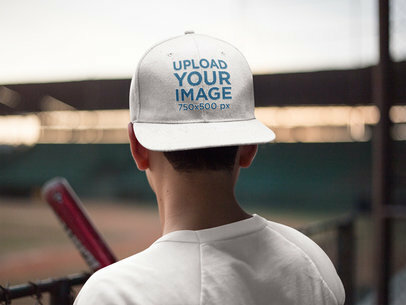 This awesome stop-motion mockup of a guy wearing a hat on a baseball field is a great mockup for you if you are looking to promote your trendiest hat design! All you need to do to merge your design with this stop-motion is drag-and-drop your file on this interface, we will merge it for you! No Photoshop needed. Try another Hat Mockup! Were you looking for an awesome way to showcase your baseball hat design? This is it! Drag-and-drop the image file, we will take care of the processing. Just a few seconds later, you will see the result! Don't forget to choose an awesome color. Try another Hat Mockup! Do you want to show your latest hat design in an appealing way? 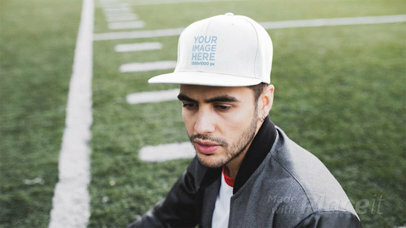 Use this stop-motion mockup of a young man wearing a hat at a football field and make an impact! Just drag-and-drop your image design on the interface, we will merge it with the mockup for you in just seconds! Try another Hat Mockup! Check out this awesome mockup by Placeit! It's featuring a trendy guy wearing a hat at a football field, and since it's a stop-motion, it's an awesome addition for you to showcase your latest and most trendy hat designs! All you'll need to do is drag-and-drop your image file, we will merge it in just seconds! Try another Hat Mockup! For best results, we recommend uploading an image that is 1000x1400 px. The file must be smaller than 5MB and not exceed 5000 px on either height or width. Promote your latest urban designs with Placeit! All you need to do is drag n' drop your png or jpeg file on the interface, it will be processed in just seconds. That's right, just seconds. What are you waiting for? Do it and start enjoying an amazing increase in your revenue. This video of a hipster man with a mustache wearing a snapback hat while in the city is awesome to start. Try another Hat Mockup! For best results, we recommend uploading an image that is 1500x1000 px. The file must be smaller than 5MB and not exceed 5000 px on either height or width. Start promoting your latest snapback hat designs in a really creative and beautiful manner! Use Placeit's visual assets, you'll see how your revenue increases day by day. Start now! Drag and drop your design image on the interface, we will merge it for you with the hat. After a few seconds, it'll be merged with this girl's snapback hat, she's under a tree's shadow outdoor. Remember to choose a color! Try another Hat Mockup! For best results, we recommend uploading an image that is 1500x1000 px. The file must be smaller than 5MB and not exceed 5000 px on either height or width. 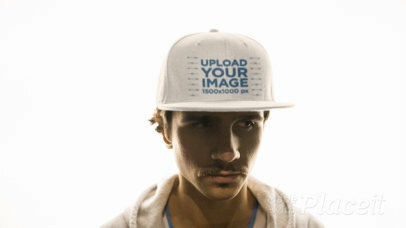 Start showcasing your awesome snapback hat designs with Placeit videos! This urban video of a young hispanic man riding a bike in a skatepark while wearing a snapback hat is an awesome choice if you are looking to promote your designs in a more creative and smarter way. Start now! All you have to do is drag-and-drop a jpeg or png file on the interface, we will process it automatically. If a picture says more than a thousand words, imagine what a video says! 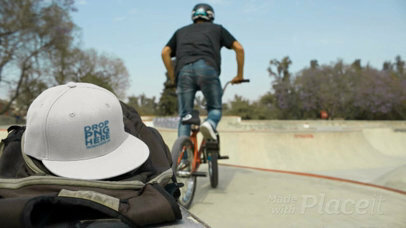 Start showcasing your awesome snapback hat designs with Placeit videos! This urban video of a young hispanic man riding a bike in a skatepark while wearing a snapback hat is an awesome choice if you are looking to promote your designs in a more creative and smarter way. Start now! All you have to do is drag-and-drop a jpeg or png file on the interface, we will process it automatically. If a picture says more than a thousand words, imagine what a video says! Try another Snapback Hat Mockup! Start promoting your brand the best way, use Placeit! Put your design on this video of a young white man wearing a hat while near a lake, it's a great option to show beautiful and realistic assets to your audience. They'll know what your design looks like in real life. All you need to do to merge your image with this young man's hat is drag-and-drop the png or jpeg file on the interface. That's all! Remember to choose your color and after a few seconds it will be ready. Try another Hat Mockup! Start displaying your coolest designs by using Placeit's video templates! All you need to do is drag-and-drop your jpeg or png file on the interface and we will merge it for you in just seconds. That's right, start now! Choose your hat color and put your design in this video of a young guy riding a BMW bike while wearing a snapback hat backward in a skatepark! Make your revenue grow right now. Try another Hat Mockup! For best results, we recommend uploading an image that is 1500x1000 px. The file must be smaller than 5MB and not exceed 5000 px on either height or width. Were you looking for an awesome tool to make your hat designs stand out? You've reached an awesome mockup stop motion with a young white woman wearing a hat while sitting down in concrete stairways. Drag and drop your image on the interface, and we will merge it with the hat for you! Remember to also choose your color. Try another Hat Mockup here! Were you looking for a creative way to showcase your latest hat design? Drag-and-drop your image file on our interface, we will merge it immediately with this awesome stop-motion mockup! That's right, your design will appear in this pretty girl's hat while she's spinning on 360 degrees! Boost your sales now! Try another Hat Mockup! Showcase your most awesome designs using Placeit's videos! All you have to do is drag and drop your design image on the interface, it'll be automatically processed in seconds. That's right, just make sure to choose the right color! This video is featuring a serious young hispanic girl wearing a snapback hat while hanging out at the cafeteria, it's a great choice for you to display urban designs. Make more money selling hats now! Try another Hat Mockup! Start promoting your most awesome designs using beautiful visual assets! All you have to do is drag-and-drop your image design on the interface, we will take care of it. 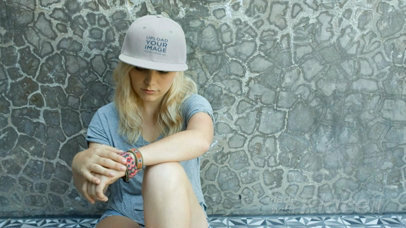 After a few seconds you will see your design displayed on this trendy girl's snapback hat. She's sitting on some concrete stairways while making faces to the camera. Make your income grow now with Placeit! Try another Hat Mockup! 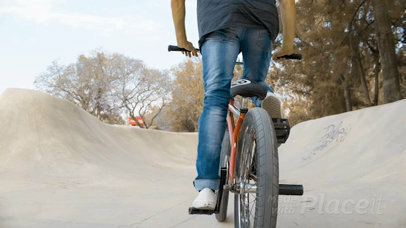 Start promoting your brand with this awesome video mockup of a young biker dude wearing a snapback hat while in the skatepark, he's waiting for his turn to ride his BMX and finally rides it. 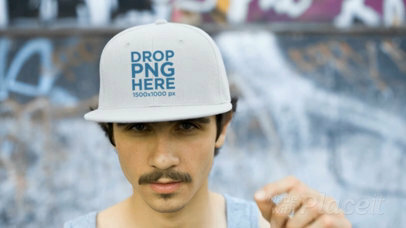 All you have to do is drag-and-drop your image design on the interface, it will be automatically merged with his hat. That's right! In seconds you'll have your design put on a professional and awesome video. Isn't it great? Start now! Try another Hat Mockup! Start showcasing the coolest designs with Placeit's video mockups! All you have to do is drag-and-drop your design file on the interface, it'll be automatically processed for you. That's right, after a few seconds you'll see it on this dude's hat. This video features a white guy with a moustache wearing a snapback hat with a really shiny white background, it's a perfect way to showcase designs that inspire the best of people! Start now and make more money with Placeit! Try another Hat Mockup here! For best results, we recommend uploading an image that is 1500x1000 px. The file must be smaller than 5MB and not exceed 5000 px on either height or width. Start promoting your designs with Placeit's visual assets. All you have to do is drag-and-drop a jpeg or png image file on the interface, we will merge it for you in just seconds! 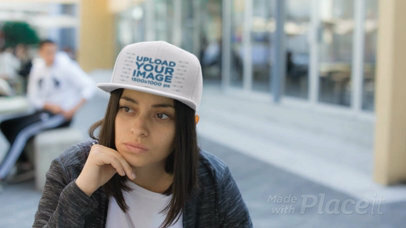 That's right, this video mockup of a young woman wearing a snapback hat while in the city is an awesome visual option that will help your brand stand out! Start now, don't forget to choose your hat color. Try another Hat Mockup! For best results, we recommend uploading an image that is 1500x1000 px. The file must be smaller than 5MB and not exceed 5000 px on either height or width. Take a look at this awesome video of a blonde girl wearing a snapback hat while chilling at a skating park, it's an excellent visual that you can use if you are looking to promote your latest design in a more beautiful and realistic way! Use the menu on the left to choose a color for the hat and to upload your design, then use the Generate button and you'll see the video done. Try another Hat Mockup! For best results, we recommend uploading an image that is 1500x1000 px. The file must be smaller than 5MB and not exceed 5000 px on either height or width. Use this awesome video mockup featuring a young skater girl wearing a snapback hat and promote your latest design in a more realistic way! 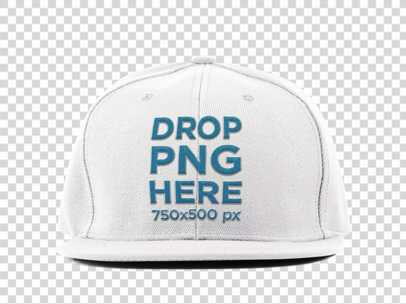 Use the menu on the left to choose a color for the hat and to upload your design image file, then click on the Generate button and see your video getting done in just a moment. Simple, right? Try another Hat Mockup! For best results, we recommend uploading an image that is 1500x1000 px. The file must be smaller than 5MB and not exceed 5000 px on either height or width. Start promoting your most awesome designs using beautiful video mockups now! Take a look at this one, featuring a beautiful young lady wearing a snapback hat while against a metal curtain. 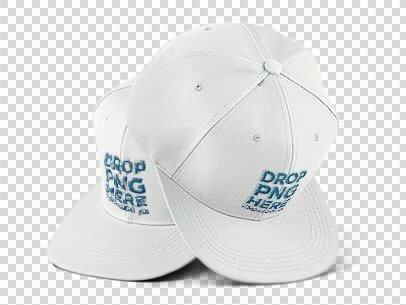 All you have to do to merge your design with her hat is drag-and-drop an image file, we will merge the jpeg or png file and you'll see the result in just seconds. It's great, isn't it? Don't hesitate, make your income grow! Try another Hat Mockup! Start promoting your awesome designs right now! All you need to do is drag n' drop an image design on the interface, we will have it processed for you in just seconds. This video of a young girl wearing a snapback hat while sitting on a bench outdoors is a beautiful visual asset that will make your designs stand out! 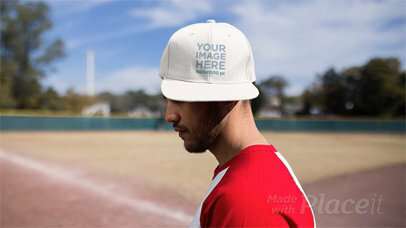 Start making your own Placeit videos now and boost your sales.Try another Hat Mockup here! Begin to use clothing mockups to help you boost your visual marketing campaign and once and for all get your ideas the attention they deserve! 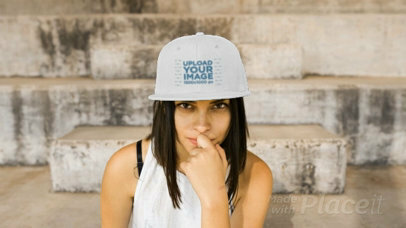 This hat mockup features a beautiful young woman wearing a hat. Customize this original mockup by simply dragging and dropping an image of one of your designs onto the template and let Placeit handle the rest of the work for you. In just a matter of minutes you will get an outstanding image ready to be used to as part of your visual marketing campaign! So what are you waiting for? Say goodbye to your outdated marketing strategy and begin to use clothing mockups today! To see another Hat Mockup click here! For best results, we recommend uploading an image that is 1500x1000 px. The file must be smaller than 5MB and not exceed 5000 px on either height or width. 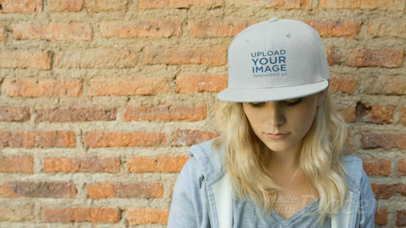 Check out this video mockup of a young skater woman wearing a snapback hat while sitting down against a bricks wall, it's everything you need to promote your latest design in an appealing and trendy manner. 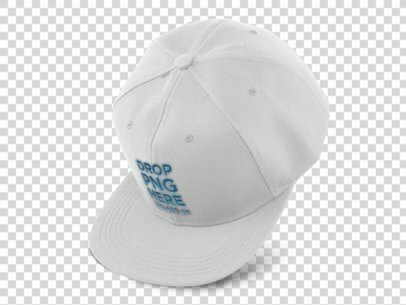 All you will need to do is drag n' drop a jpeg or png over the interface, we will merge it with the hat for you in just seconds! Isn't it great? Try another T-Shirt Mockup! For best results, we recommend uploading an image that is 1000x1400 px. The file must be smaller than 5MB and not exceed 5000 px on either height or width. 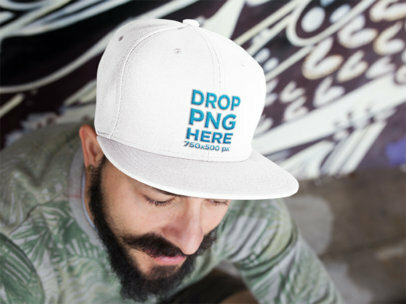 Start showcasing your snapback hat designs with professional and creative visual assets from Placeit! Start now, this video features a young biker dude wearing a snapback hat while hanging out at the skatepark. All you gotta do is drag-and-drop a jpeg or png file on the interface, we will process it for you in just seconds! Try another Hat Video Mockup!